Stylus, style and math savvy: Xpanded learning power is at hand. Go grab any software package on the market today and youre likely to read claims of "interactive" or "dynamic," or a user interface that is "intuitive" or "easy-to-use." Few actually deliver on that promise, of course -- with no concrete definition of such attributes, anyone can claim them -- which makes those products that do deliver so startlingly superior that its a shame you cant tell just by reading the box. So, how will I recognize such qualities in the next generation of software, specifically in my field, which is hand-held technology designed exclusively for education? Surely it will claim to be all of the above. It must be interactive to engage students, and it must be dynamic to help them make connections. The interface must be easy-to-use and intuitive so that classroom time is spent on using the device to learn mathematics, not on learning how to use the device. An interactive grapher would let us enter graphs in a variety of ways. Wed just make a sketch right on the screen, and convert it into a mathematically correct graph on the fly. If that grapher were truly dynamic, moreover, we could control the graph window -- move around or zoom in or out directly -- without a separate environment for the window settings. And wed have equally direct ways of translating and dilating existing graphs, seeing the effects on the equations at the same time that the transformations occur. Likewise, a dynamic and interactive geometry environment would proactively encourage speculation and exploration. A triangle could be constrained to be a right triangle at one time and obtuse at another, without reconstructing. If a student were to draw what appears to be a right triangle, the device might even ask the student if he/she would like the triangle to have that property. Wouldnt that be great? Such an intuitive interface in these fundamental topic areas would really foster mathematical thinking -- with a maximum of transparency between thought and deed. It would accept the way we work with paper and pencil and try to bring those ways to life on an active screen. It might even offer electronic lessons, formatted to focus a students attention, engage the students imagination, and encourage conceptual rather than computational development. And a truly revolutionary device might even go one step farther and give teachers the took they need to create their own electronic lessons -- faster than they could document them in their lesson plans. That would be a dream come true. Xpander is a friendly, engaging, personal handheld learning partner for high school teachers and students. It has fewer keys, a larger screen and easy stylus input for seamless learning -- anywhere, anytime. Xpander comes ready with exploratory math learning software and e-lessons to help students learn by doing, not by rote. And its flexible expansion card slot and PC connectivity open the door to multi-subject learning, communication, memory expansion and many other exciting future possibilities. All this -- in a package that fits into the palm of your hand (6.4" x 3.5" x 0.9") and runs on two rechargeable AA batteries. What does this mean for math learning? It means that students can learn more intuitively, flexibly and individually. Xpander has interactive and dynamic environments for geometry, algebra, tables and matrices. As students use the stylus (pen) directly on the large grayscale screen, they see equations, graphs and table values all change together, in real time. And with built-in demonstration interactive e-lessons, teachers can harness this dynamic power in self-contained lesson units to reach more students with less time, effort and stress. 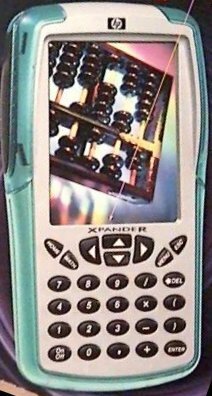 How is Xpander different than [sic] a calculator? First, its more user-friendly and engaging. It has fewer buttons, a larger screen, on-line help and pen-based input. Its also more exploratory, with a discovery-based interface, built-in math learning software and e-lessons. And even with all that, its more flexible too. Its compact flash card slot presents opportunities for learning beyond math and science: with future memory expansion, fun and communication possibilities, the skys the limit.